Seeing the name Jim Henson attached to the title of a production naturally builds a degree of expectation, recalling memories of the family-friendly wonders that his company so delightfully brought to screens over the years, both large and small. Within those projects, they combined dense emotions with fantastical tales that could appeal to both older and younger audiences, supporting the dazzling animatronic designs and puppetry with ample stories that give them purpose. In the late '60s, Henson and collaborator Jerry Juhl dreamed up such an idea with "The Musical Monsters of Turkey Hollow", a proposed Thanksgiving television special that, despite some of the creature design work being completed, didn't make it into production, getting filed away in the company's archives. Emmy-winning producer Kirk R. Thatcher, one of the crucial figures behind the scenes at Henson and Industrial Light and Magic, resurrected the abandoned project for Lifetime Network as Turkey Hollow, a modest success in its creature design that struggles to capture the versatile magic of the Henson catalog. With Thatcher taking a third slot in the writing credits, Turkey Hollow relies on an easygoing collection of classic family-friendly tropes, starting off with a ride in the car with the Emmerson clan as they travel to the rural township of the film's name. Recently coming off a divorce, father Ron (Jay Harrington) has decided to reconnect with some of his extended relatives, which leads to him taking his two kids -- curious Tim (Graham Verchere) and sarcastic teenager Annie (Genevieve Buechner) -- to visit his prickly, oddball aunt Cly (Mary Steenburgen) in the middle of turkey-farming country for Thanksgiving. On their way, they learn about the legend of the "Howling Hoodoo", a local superstition akin to Bigfoot that sparks Tim's attention, both a positive and negative thing once the Emmersons arrive at Aunt Cly's house and discover the absence of any television, internet, or much of any electronic devices. After Tim does a little more digging into the town's lore, he decides to fill his time by looking for the 10-foot monster in hopes of photographing it, sending him into the surrounding enchanted forest without knowing exactly what he's going to find. Broken up by strange and unfunny self-referential narration from rapper/actor Ludacris, Turkey Hollow spends the first half-hour making sure everyone knows that the Emmerson family are, indeed, in the middle of a family separation. Stiff, corny chatter about undesirable nicknames and avoiding the word "divorce" push the limits of what's excusable for the sake of getting to the whimsy of a family fantasy film, which isn't helped by its collection of over-expressive performances. That is, except for Mary Steenburgen as Aunt Cly, who steps outside her comfort zone of cheery mother figures and into the rigid, grouchy mannerisms of a reclusive herbalist, which mostly ends up suppressing her charms. The dynamic going on inside her plant-invaded farmhouse always feels labored, hammering home the difficulties of divorce on children and monetary woes on adults without the effortlessness that'd make them actually feel like a dysfunctional family. The drama's there, but the authenticity isn't. Everything going on in Turkey Hollow stays by-the-books without really trying to hide it, especially once a dispute with a local turkey farmer -- over money owed and property being seized -- scares up a conflict that forces the entire family into the enchanted woods, the domain of the Howling Hoodoo. Kirk R. Thatcher and the crew at Jim Henson's Creature Shop restored archived puppet designs from the '60s in creation of the other critters lurking about in the forest: a foursome of scraggly, yellow-eyed monsters with distinct personalities, whom inject some much-needed character into the story upon their arrival. Despite their quirky charms and the believable fluidity of their onscreen appearance, their interactions with the humans feel tacked-on and nonsensical, struggling with the balancing act between what's amusing and what's over-the-top. Cracking jokes about how they gobble down rocks is one thing; watching them lunge through the air and eat them to the tune of "The Blue Danube Waltz" is another. 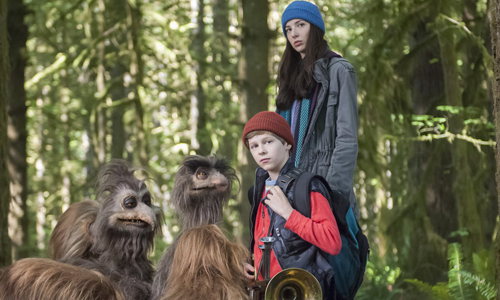 The critters and the mystical essence of the forest itself does make one want to appreciate what Turkey Hollow wishes to convey about getting attuned to the magic of nature and enriching relationships with family, but the formulaic and absurd sequence of events throughout the primary conflict continues to lose that along the way. A lot goes on at the end of this Lifetime movie, too, from car chases to discovering the identity of the Howling Hoodoo, but Kirk R. Thatcher never finds a way to increase the suspense of a melodramatic plot so clearly designed to be as secure and reassuring in its outcomes as possible. Sappy dialogue, flirtations with awkward sexual entendres, and cartoonish bad guys -- let alone Ludacris's interjections with fourth-wall-breaking narration -- shouldn't be this monotonous, getting to a point where I started just marveling at the goofy realism of the monsters and wondering whether they might originate from Jareth's labyrinth or from Fraggle Rock.